The quantities dried are given in tons per 50 m of drying rack, it should be noted that the drying times are reduced from about 4 to 5 weeks for untreated rack dried sultanas to 8 to 14 days for treated sultanas dried on a similar rack vir.der average conditions. **Hot Dip: a) 1,8 Kg of Sodium hydroxide per 450 It of water at 93°C. b) 1,4 Kg of Sodium hydroxide per 450 It of water at boiling point. The dipping time is 4 seconds. It is preferable to use these racks in climatic regions characterized by hot, dry weather and gentle winds. The racks may be used under many climatic conditions, and their performance will be contingent on the prevailing local weather. Occasionally, when deemed necessary, the whble rack can be enclosed in plastic,or other sheeting,and heated air pumped in at one end so that it acts as an artificial dehydrator. The racks should preferably be aligned on a North-South axis lengthwise, in order to effectively make use of the early morning and late afternoon solar radiation, it is preferable to locate the racks on a rise of land, clear of any obstructions to permit free air flow. If many racks are used in one location, they should be at least 9 to 12 meters apart. To compensate for slower air movement near the ground, the lower racks are often given a greater tier spacing, up to 36 cm, and the upper racks spacing can be reduced to 18 cm. Cost of materials: Not reported. Labour content high. Annual operating Expenditure: Maintenance costs almost negligible. Cost of drying related to the Amount of Materials dried; Not reported. The loading of the racks with fresh fruit tends to involve a good deal of strenuous effort. In fine drying weather, there are few problems but if rain falls and is not quick followed by drying winds, the fruit can go mouldy on the racks. This case study presents the main results obtained from testings made on a vertical wire mesh drying system specifically designed for the drying of cassava particles. This drying system utilizes more efficiently the available energy of the ambient air to evaporate the moisture content of cassava. The drying method gives a high quality cassava that is easy to store and handle. 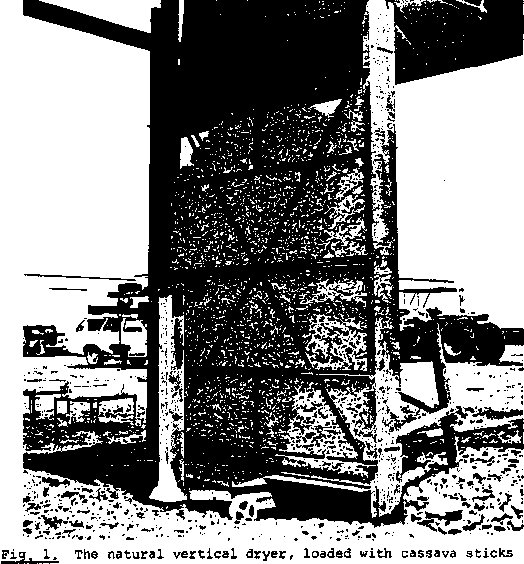 The vertical dryer shown in Figure 1, consists of two wire mesh panels pinned on two wooden uprights which are set in the ground and act simultaneously as supports and end walls. Top and bottom openings make the dryer easy to load and unload. The distance between the wire screen walls has been made variable in the experimental prototype so as to allow the drying space to be charged with different loading densities of cassava per square meter of exposed surface. The unit is covered with a wooden roof to protect the product from rain and to allow the drying to continue overnight. This vertical dryer was developed from experiments on several similar prototypes of smaller size. 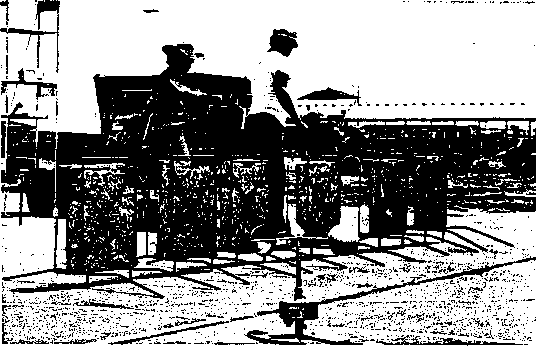 Figure 2 shows a number of these small units under testing. All the wood used in the construction was locally available. The two uprights were joined on each side by three angle iron bars set horizontally. The vertical wire mesh walls are reinforced with metal crossbars to ensure an even thickness through the drying section. Cassava chips, unless they reach 50 percent moisture content (wet basis) in the first day of drying, will deteriorate rapidly in quality. With this condition in mind, charts have been developped which indicate the quantities of Cassava which can be dried given the specific set of climatological conditions occuring on a specific drying day. The charts are presented in Figure 4. Cassava chips being white, have a very high reflectivity and do not absorb much incoming solar radiation. 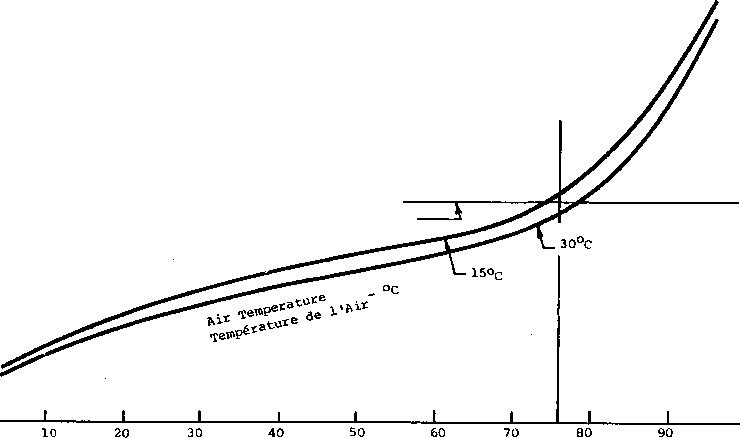 This is the reason why this dryer has been designed mainly to improve the use of the air flow (see Fig.5 ). Significant reductions in coats are expected by using a more simple unit and less expensive materials. No restriction in cost was attempted in the experimental unit. The first tentative figures are: U.S. $10.00 per dried ton of cassava of which $2.50 corresponds to labour cost.
. construction and operation are simple.
. Vertical racks are more difficult to fill than inclined wire mesh trays: 20 to 30 minutes are rerm-ired to load the experimental unit and 10 to 20 minutes to unload the processed product.
. Drying in vertical dryers takes about one-half the time required for floor and wooden tray sun drying. 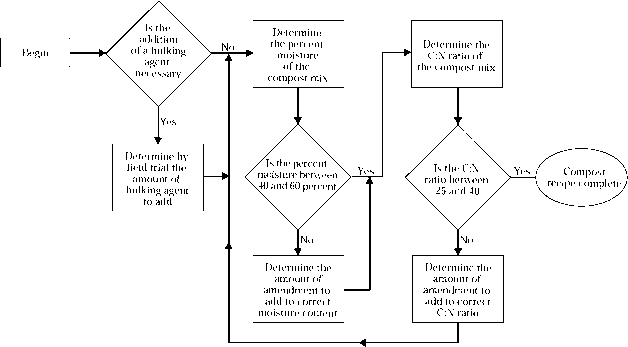 See Figure 5.
. Overexposure of the product when drying is completed should be avoided due to possible insect infestation.
. As cassava is normally grown for periods of 10 to 24 months, the harvesting during the dry season, where the drying conditions are more favourable, is recommended. If the relative humidity on a day is higher than 75%, supplemental heat should be used to assist the drying process. Solar dryers will be the ideal complement of the natural vertical drying racks for this purpose.
. A mathematical model developed so as to predict with good accuracy the drying performances of the vertical dryer under different climatic conditions. (Figure 4). Engineering Department, Michigan State University, East Lansing, Michigan, U,S .A.